Formally constituted in the fall of 1977, the Second Sixties Outdoor Club became the first senior’s outdoor club in the City of Calgary and the province of Alberta. Up to that time, all senior’s organizations offered a variety of indoor activities, such as bridge, but no outdoor activities. Today, the Club continues to be one of the few seniors clubs in Calgary offering its members the opportunity to participate in year-round outdoor activities. The Club originated in late 1976, as a result of a City of Calgary Recreation initiative to encourage seniors’ involvement with outdoor activities. The Program Coordinator Jim McDonald hired Bill Skrastins, an experienced cross-country skiing instructor to conduct ‘learn to ski’ classes at Shaganappi Golf Course. Seven adventurous souls associated with the Confederation Park 55+ Activity Centre took advantage of the classes and in the following spring decided to continue their activities to include hiking and to bring in like-minded friends. By the fall of 1977 the group had formalized into a club, selected its name and having satisfied constitutional requirements for By-Laws and Operating Policies was registered with the Provincial Government as The Second Sixties Outdoor Club (Confederation Park). A short while later the group held an internal competition for a Club Crest and the winning proposal was incorporated into a lovely painting that today hangs in the Confederation Park 55+ Activity Centre. Club activities were originally focused on cross-country skiing in the winter and hiking for the summer but soon golf, camping and associated social events were added. More recently snowshoeing has become an important winter activity and the Club has established a highly popular City Walkers group. A key element of the Club has been its use of buses to take members to Bragg Creek, Kananaskis Country and National Parks within day trip range. Originally the City of Calgary Recreation Department provided a 12 passenger Panel Bus. Later the Club used school buses provided by Cardinal Coach Lines (now First Student Canada) and eventually more comfortable coaches were employed. Our current bus provider is Quality Time Holidays International Ltd. The club emphasizes recreation and healthy exercise with friendship and convivial social interaction. An active social program is maintained. All club members are expected to take their turn in the administration of club activities. The Club is especially proud of providing options to ensure its members can continue to be part of the Club and maintain their friendships as physical capabilities decrease with age. 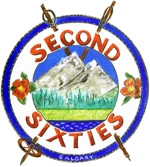 The Second Sixties Outdoor Club is part of the Alliance of Calgary Senior Outdoor Clubs and is a member of the Alberta Hiking Association. It participates with nine other senior’s outdoor clubs in a group liability insurance policy designed to protect the Club and its members. The Club celebrated its 40th anniversary in 2016. The popularity of the Club continues to this day, with membership of over 250 active seniors, some having been members for over 20 years, others newly retired or even still employed, all enjoying the wide variety of activities offered by this dynamic Club. The framed painting seen to the right is held at the Confederation Park 55+ Activity Centre. In patriotic colours, the emblem is symbolic with the name of the organization prominent, encompassing a blue sky over two mountain peaks; one representing the first sixty years and the second whatever our ultimate might be in the second sixties. Purposely designed are the trees representing the forests, and the fields which are also traversed, and the waters, be it lakes or rivers, wherein or whereon, those who belong find time to explore and enjoy. Needless to say, the wild roses balancing the motif spell ‘Alberta’. The crossed ski pole and hiking stick are symbolic of anything that provides we mortals with mental and physical support enabling us to magnify those God-given wonders of this realm. 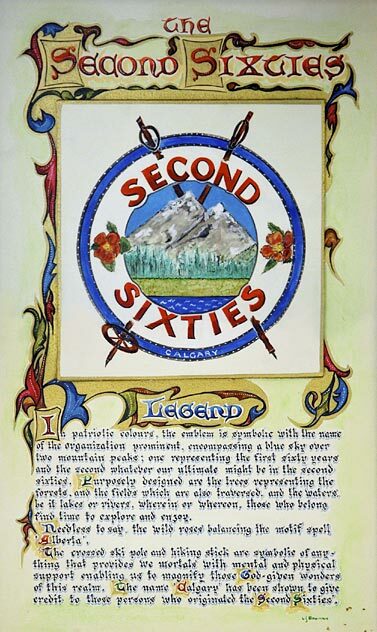 The name ‘Calgary’ has been shown to give credit to those persons who originated the ‘Second Sixties’.